So, I took The Favorite Son to one of my favorite summer places, the Warwick Drive-In in Warwick, New York to see "Ghostbusters" (2016). The drive-in atmosphere on a warm, New York summer night was fantastic. However, at the risk of being labeled a misogynistic, chauvinist, unevolved, knuckle-dragging ape, (it wouldn’t be the first time), this movie is an epic disappointment to anyone who appreciates the Ghostbusters franchise. I’m not sure whether it is the dearth of chemistry among the cast or the fact that Harold Ramis is no longer available to write the script, but the dynamic buddy comedy vibe featured in the original "Ghostbusters" and "Ghostbusters II" just doesn't exist. 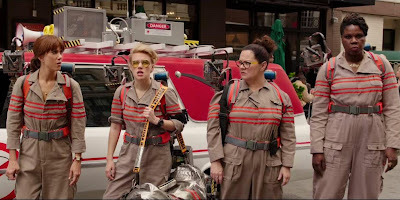 Frankly, there isn’t even the same energy in "Ghostbusters 2016," (to which I'll hereafter refer to it), as there was in "Bridesmaids," which I enjoyed and which featured some of the same actors. The script, written by Katie Dippold and Paul Feig, could hardly be less imaginative. 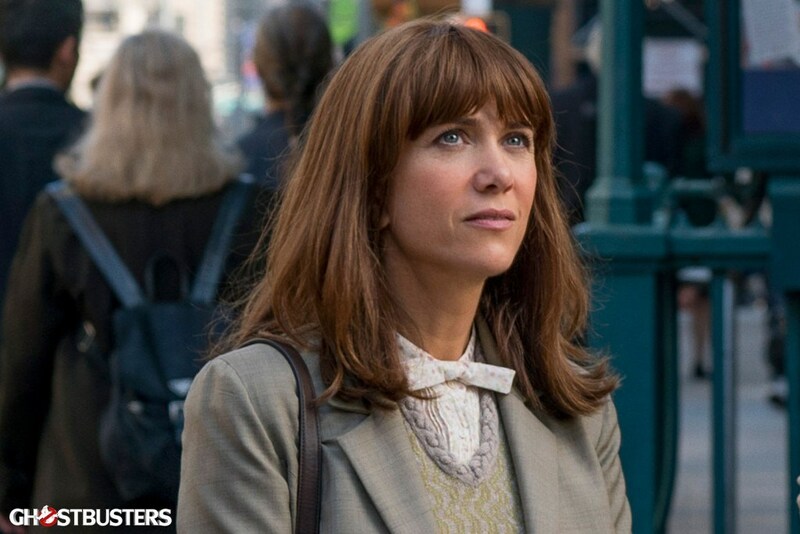 Kristen Wiig is Erin Gilbert, a college professor whose tenure is jeopardized by the reemergence of a book about the paranormal, which she wrote with her estranged friend Abby Yates (Melissa McCarthy). Abby, a la Ray Stantz from the original, works with Jillian Holzman (Kate McKinnon) on a number nerdy, paranormal projects at a trade school community college. All three are, predictably, fired from their jobs after a YouTube video surfaces of the three investigating a paranormal phenomenon. Obviously, the respective school administrations view paranormal research as crackpot. From there, the plot vacillates from the story lines of "Ghostbusters" and "Ghostbusters II." 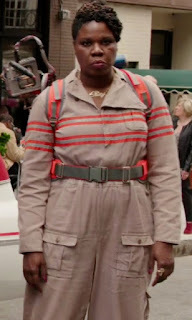 The fourth buster, Metro Transit Authority worker, Patty Tolan (Leslie Jones), joins the team after she witnesses a subway ghost after a hotel janitor, Rowan North (Neil Casey), creates a ghost portal. Not unlike Janosz Poha (Peter MacNicol) in "Ghostbusters II," North plots to summon all underworld demons to change the natural order on Earth, where North believes he has been poorly treated. If the intention was to make a copy, the copy is a poor one. If the intention was to make an homage, movie is a disappointing homage. If the intention was to create a film to entertain, it fails miserably. Wiig’s performance is wooden and lacks the ability to be the touchstone for the humorous irreverence of Bill Murray’s Peter Venkman. Like a two-year old child who’d learned a new phrase from her mommy Melissa McCarthy endlessly repeats, "Power up" and “Light ‘em up.” Kate McKinnon tries way too hard to be the quirky one in the contrast to Harold Ramis’ understated obsessive compulsive Egon Spengler. Leslie Jones’s loud and proud portrayal of Patty Tolan, reportedly written for Eddie Murphy in the originals, is obnoxious. I wish I could say that the cameo appearances by all but two (Harold Ramis, Rick Moranis) of the original cast made a cute or fun connection with the original, but those performances were flat and pointless. Dan Aykroyd is a cab driver who wouldn’t drive to Chinatown. 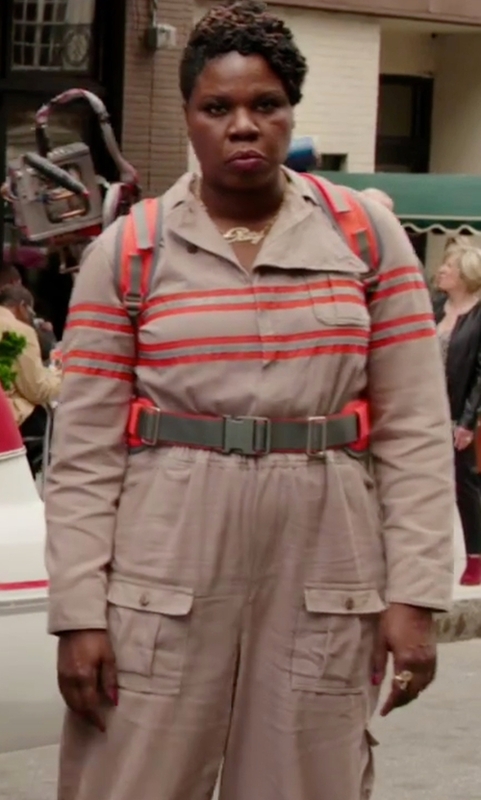 Ernie Hudson is Patty Tolan’s uncle who owns the mortuary from which she re-purposes a hearse as New York State registration ECTO-1. Very original, huh? Sigourney Weaver makes a brief appearance as the flaky mentor of one of the Ghostbusteresses. Bill Murray portrays paranormal debunker, Martin Heiss, and turns in a mediocre performance in two scenes before he is unceremoniously killed by curiosity. As a tip of the cap to Harold Ramis, his son, Daniel, appears in a minor role as a concert goer during a ghostbusting scene. Other cameo appearances include Annie Potts, Ozzy Osborne, Al Roker, local New York newscasters Greg Kelly and Rosanna Scotto, and Slimer. Sadly, however, the short of Harold Ramis returning perhaps as a ghost himself to have written a better script and perhaps to have convinced the original cast to have made the reboot, none of the cameos nor anything else could have saved "Ghostbusters 2016." I just hope we aren’t haunted by endless, senseless sequels every two or three years. I might just cough up some ectoplasm myself.